When you begin your research it is important to know about the specific records that are associated with the location, time period, ethnic group, or religion. Understanding the lives that Jewish people led upon arriving in the U.S. can help you identify common records that would have been created in their life. Most people know about the common records that are used in genealogy, such as census records, vital records, military records, but for Jewish life there are a few which you may not have been aware. As with any religion there are rituals that are performed throughout a person's life. For Jewish children the first ceremony that is typically performed is the circumcision or brit milah (bris) for boys. In contemporary society a family may have a brit bat (naming or covenant ceremony) for their baby girl. These ceremonies held within just a few days of the baby's birth are often held at the home or at the family's synagogue during morning services. Such ceremonies are to further link the child to its Jewish roots, religion, and community. Records of such events can be invitations by the family to guests, synagogue programs and newsletters, documents of the Rabbi overseeing the ceremony, and the mohel (the doctor performing the circumcision) will have documented the event. In some families the children may attend a Hebrew School. In addition to standard curriculum taught in schools they will learn Hebrew, history of the Jewish people, and delve into the religion. Yearbooks, newsletters, and school records may have your ancestors in them. 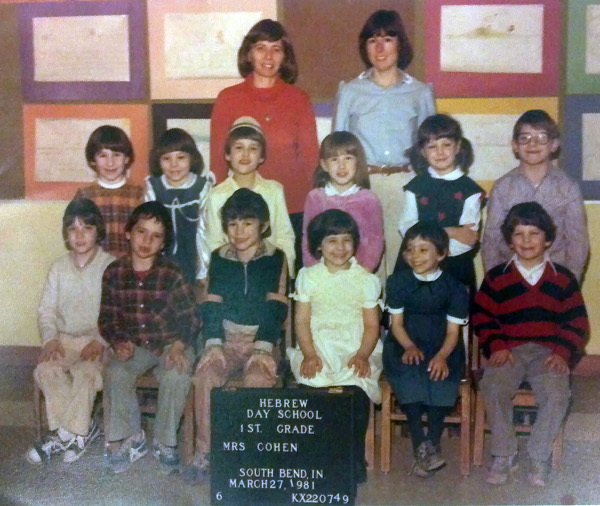 Class portrait of the author from the South Bend Hebrew Day School in 1981. At the age of 13 years old, boys have a bar mitzvah, a rite of passage acknowledging their coming of age in Jewish society. Originally the ritual was simply between the father and son, but the 14th century brought a more public step when the boy was invited to come to the Torah and read at the Sabbath following his 13th birthday. Gradually it became even more and by the 17th century the boys were asked to speak more of a commentary on a weekly Torah portion. By the 19th century further changes in the ritual included a confirmation of the boy's knowledge of the Jewish faith. Eventually the Reform Judaism movement opened up the confirmation ceremony to girls and only in contemporary society have bat mitzvahs become accepted. 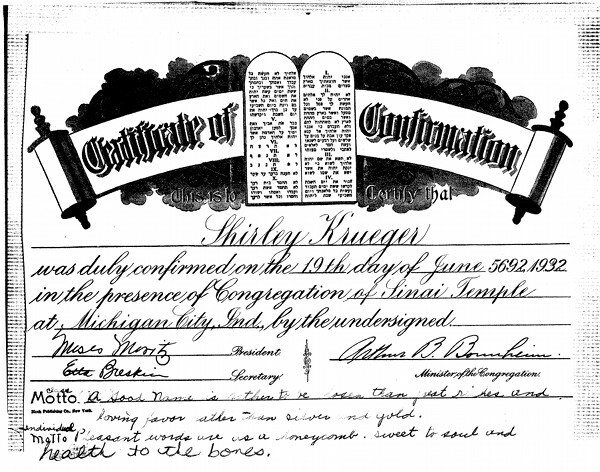 My grandmother's generation was permitted to have a confirmation, but not a bat mitzvah. You can see her confirmation certificate below. My generation had both bar and bat mitzvahs which included an invitation sent to all close friends and family. The synagogue often would provide the necessary classes to prepare the boy or girl for the ritual. The ceremony would be held at the synagogue and then afterwards there were often parties held there as well. Over the years it seems the parties get bigger and grander, but the main focus is on the confirmation of the boy or girls' intention to learn and follow the Jewish faith. Records of such events may be in the local newspaper, synagogue newsletter, Rabbi's papers, and there may be invitations that have circulated in the family. The next major milestone of a Jewish person's life is that of the marriage. There is a great amount of ritual involved in the marriage ceremony, but a particular interest to genealogists may be the Ketubah which serves as a beautiful marriage contract signed by the bride and groom and witnessed before the wedding. It declares the man's obligation to the wife including financial security. If your family has one, it would be found at home. It is typically signed by the husband and wife, Rabbi, and two close family members. The Jewish people are usually quite involved in their community and assisting others when possible. This is why organizations such as B'nai B'rith, Hillel Foundation, The Anti-Defamation League, Hebrew Immigrant Aid Society, and even the Masons had a great number of volunteers and donors that may have included your ancestors. The records of membership and donors are available through the organizations and local chapters. When the Jews began to immigrate to the United States, Landsmanshaften were often formed. These societies formed by Jewish immigrants from the same cities, towns, and villages in Central and Eastern Europe. In many cases, books were developed which detailed memories, photographs, and stories of the ancestral town. The landsmanshaften provided immigrants with social networks assisting with financial needs, medical care and burial plots. Databases, organized by town name, provide information on these groups and their members and can be found on JewishGen.org. At the end of a Jewish person's life there are a number of sources that can provide leads in your research. In particular cemetery headstones can be quite helpful since the Hebrew text may include the name of the deceased's father, exact date of death, and possibly the birthplace. JewishGen.org has several helpful tools to assist with translation of the Hebrew on the gravestone. Best of all is the tool named ViewMate where you can upload a photo of the grave and volunteers assist you in translation of the Hebrew. Another great tool is the calendar converter that provides the conversion between the Hebrew calendar and the civil calendar used today. 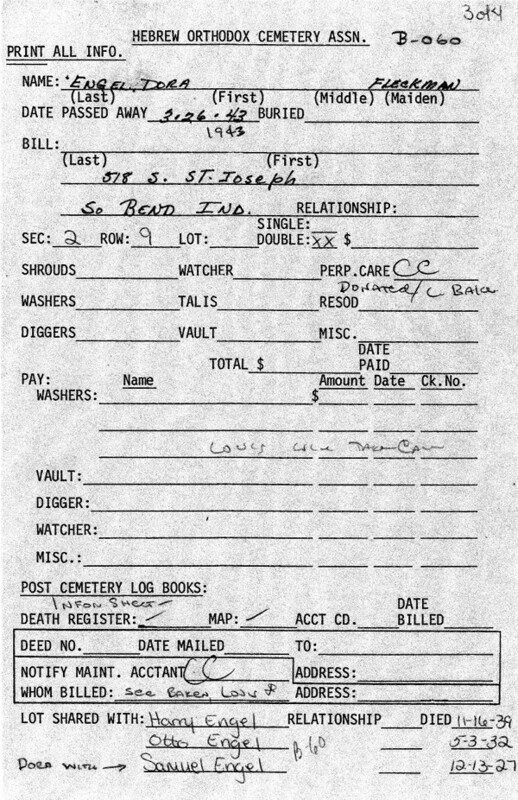 Burial records often include the date of death, burial location, who paid for the plot, who washed the deceased, who watched the deceased, and who shares the plot. The Holocaust resulted in many challenges for those researching their ancestors. However, the survivors of those communities have combined their memories in the creation of Yizkor books. These books have descriptions and histories of the community, biographies, lists of those who died, photos, maps, and other memorabilia. Copies of the Yizkor books can be found on The Internet Archive and translation efforts are underway through JewishGen. Each of these record types could potentially lead to new avenues of research for understanding your Jewish ancestors. In my own research I have benefited from new leads based on headstones, burial records, and synagogue newsletters. I only hope that this inspires you to think outside the box of vital records and censuses to find new information for your research.